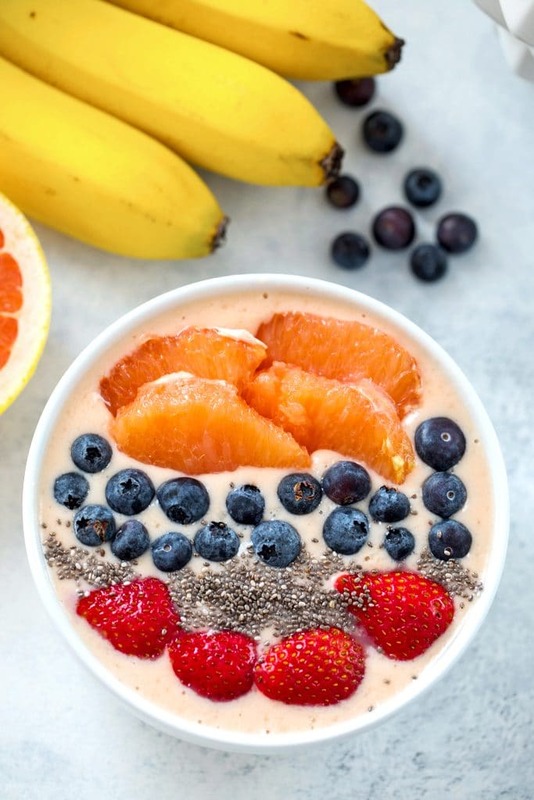 Packed with antioxidants and with a smooth and creamy texture, this grapefruit smoothie bowl is the perfect way to start a happy, well-balanced day. The best thing in life is when those healthy foods become “can’t live without foods.” For instance, when it comes to one of my all-time favorite meals, the Caesar salad, I’d actually rather have it made with kale than with romaine. Kale is more flavorful and satisfying to me (and hello to all the kale haters! Some people really do actually love it, not just because it’s trendy. I swear!). And sometimes when I’m done with dinner and craving something sweet, instead of going for the ice cream, I cut open a grapefruit and am happier than could possibly be. In fact, grapefruit is one of those foods I’d have a really, really hard time living without. I probably eat at least 3 of them a week… Sometimes more. I’m pretty sure the devil and angel sitting on my shoulders are totally confused by this habit and don’t really know what to do about it. Cue internal fighting amongst each other before the devil tries to “force” grapefruit donuts on me and the angel tells me I may be eating too many grapefruits. Lucky for me, grapefruit is one of the healthiest foods I could be obsessed with! Not only is it packed with vitamin C, vitamin A, and potassium, but there’s also research that shows it can help lower your LDL (bad cholesterol), triglycerides (artery-clogging fat), and blood pressure. I mean, most of you have probably heard of the grapefruit diet, right?? I can’t recommend you take part in that (it’s generally a super low calorie consuming diet), but getting more grapefruit into your diet is generally going to be a good thing. Also, there are only about 100 calories in a whole grapefruit and it’s packed with water so will help hydrate you. I actually think one of the reasons I crave grapefruit so much is that I’m not great at hydrating myself and my body knows grapefruits will get me what I need. I have to mention that grapefruit can actually interfere with some medications (especially blood pressure and cholesterol medications) and if you’re taking one of these meds, it may be recommended that you avoid grapefruit. SOB. I’m sorry if this is you… I’m honestly not sure what I’ll ever do if I can’t eat grapefruit. IS PINK OR WHITE GRAPEFRUIT HEALTHIER? All grapefruit is good for you, but if you have the choice, go for the pink grapefruit! 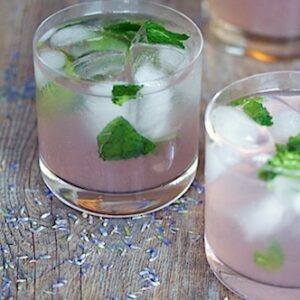 Pink grapefruits have lycopene (like tomatoes!) and beta carotene, which are the carotenoid pigments that gives the grapefruit its pink color. 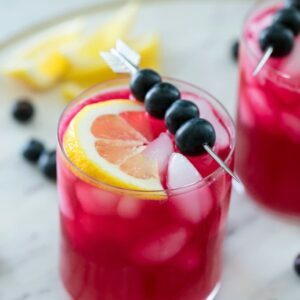 They’re both powerful antioxidants known for neutralizing free radicals in the body and working to protect against degenerative diseases (source). Sometimes I cut a grapefruit in half across its equator and then use a sharp knife to cut around each of the sections and scoop them out with a spoon. Then when I’m done eating them, I squeeze the grapefruit half and try to get out as much juice as I can! I generally eat grapefruits like this when my husband wants a half, too. Other times, I simple cut my grapefruit into slices (like I would an orange) and eat the fruit from the peel while standing at the kitchen counter. When I’m doing this, I’m usually eating the entire grapefruit! 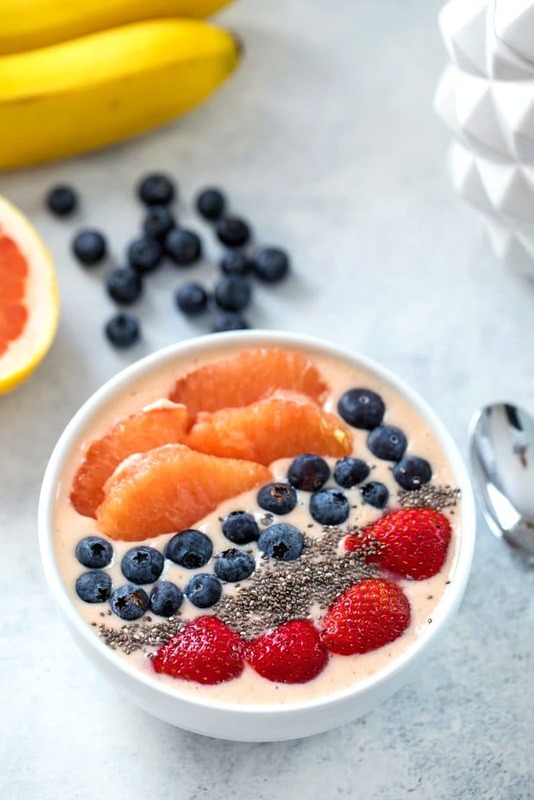 And sometimes I use grapefruits in recipes… Like in this grapefruit smoothie bowl. This recipe makes for the perfect breakfast for any grapefruit lover! It’s perfectly tart (you need to love grapefruit to enjoy this!) with a little sweetness added in from the banana and pineapple. Grapefruits are about 91% water, so I had to play with this recipe a bit to make sure the smoothie bowl wasn’t too thin. 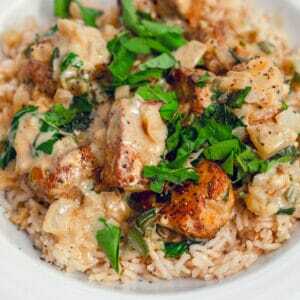 At first I wanted to make it with coconut milk, but that thinned it out too much, so I used Greek yogurt instead. That worked perfectly for me, thought it’s still a smoothie bowl a bit on the thinner side. You’ll want to start by peeling your grapefruit and taking off as much pith as you can. 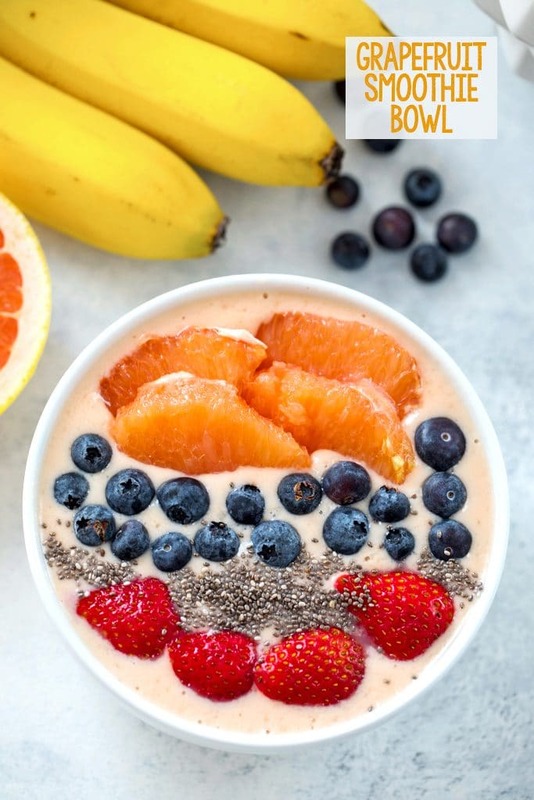 Grapefruit pith is actually super healthy for you, but it is also a big part of what gives grapefruit that bitter taste, so the more you can remove, the less bitter your smoothie bowl will be. Once it’s peeled, section the grapefruit. I am the worst grapefruit section-er in the world, but luckily, you don’t need to make your sections pretty like you would if you were using them in a salad. They’re going to be blended anyway! 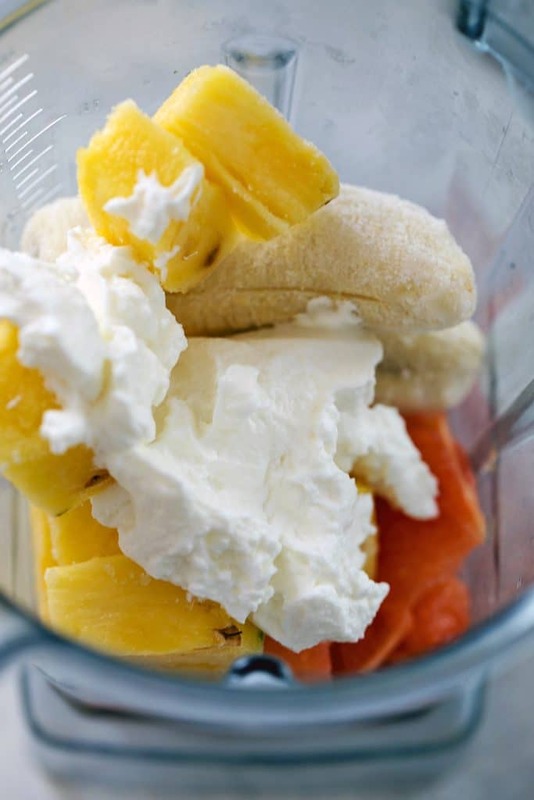 Add all the ingredients into your blender: grapefruit sections, frozen banana, pineapple, and Greek yogurt. And blend until smooth and creamy. And then pour into two bowls and add any toppings you want. I went with additional grapefruit sections, blueberries, sliced strawberries, and chia seeds. But you can add anything you think would be delicious… Or nothing at all if you’re just planning to drink this up before heading off to work. Chia seeds are another one of those powerhouse foods I try to incorporate into my diet whenever I can and I always add them into my green smoothies for an extra kick of omega-3 fatty acids, antioxidants, and fiber. Don’t get me wrong, I could eat a plain old grapefruit every day of my life and be perfectly be happy, but sometimes it’s nice to mix things up a bit and get all the flavor of my grapefruit in another fun form. I love sitting at my desk getting my early morning work done while enjoying a grapefruit smoothie bowl. And when you start your day this way, you can feel a little better about yourself when you decide to eat half a bag of chips or are recipe testing macarons and are forced to eat all the “ugly” ones (not that I’d know anything about that!). Because look! You started your day off with a ton of antioxidants. I mean, I guess I should note here that I’m not a health professional and you probably shouldn’t be taking nutrition advice from me. 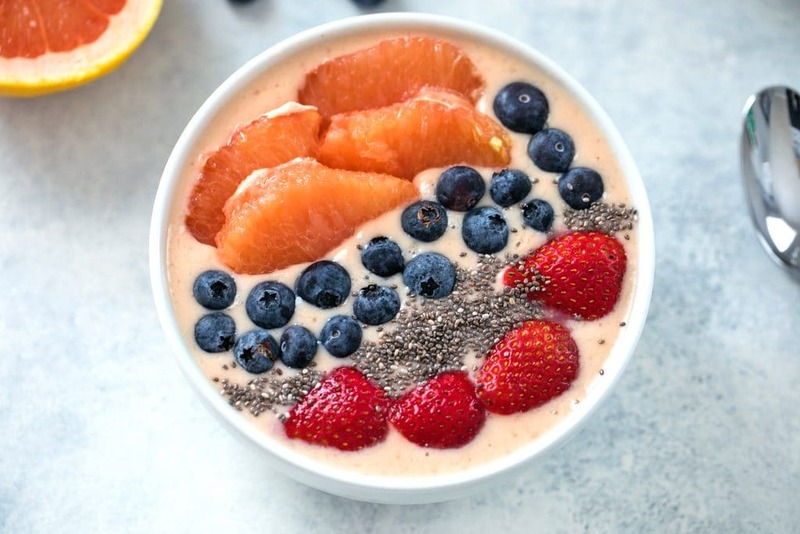 I’m not telling you to eat a box of donuts and then have this grapefruit smoothie bowl for optimal health. I’m sure you have your own little food devils and angels on your shoulders that are telling you exactly what to eat, right? What are your favorite healthy foods that you love so much you sometimes choose them over not-so-healthy foods? If you’re looking for other fun smoothie bowl recipes, check out my Pineapple Banana Ginger Smoothie Bowl or my Coconut Chia Dragon Fruit Smoothie Jars. 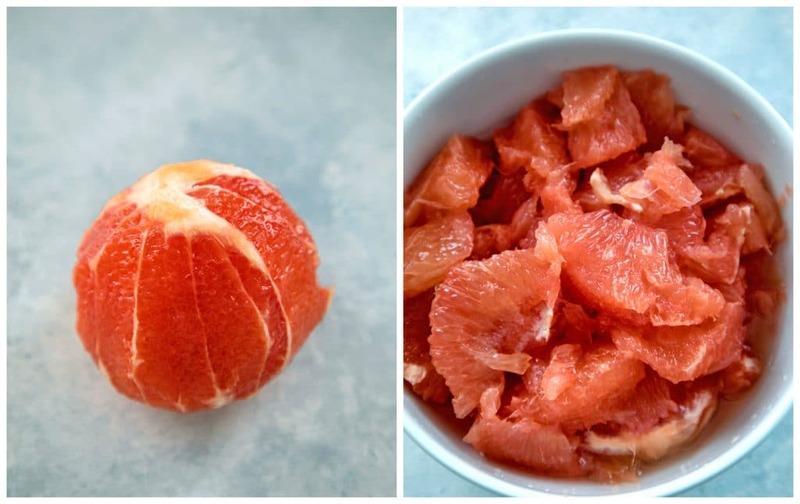 Cut off the top and bottom of each grapefruit. Standing the grapefruit on one end, remove the rest of the rind and pith in strips following fruit's contour. Then, holding the grapefruit over a bowl (to catch any juices) cut out the grapefruit segments from in between the strips of the membrane that surrounds them. Once segments are all removed, place grapefruit segments and juice in a blender and add frozen pineapple, frozen banana, and Greek yogurt. Blend until smooth. 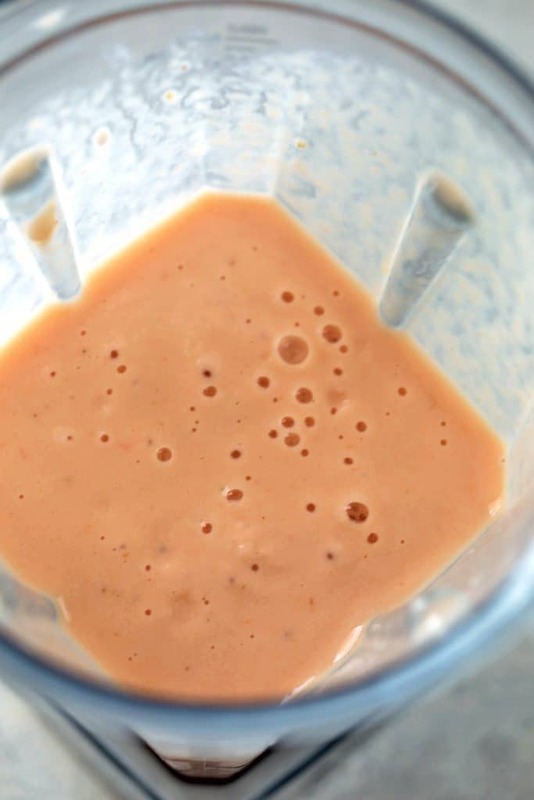 Divide grapefruit smoothie between two bowls and add toppings of your choice. 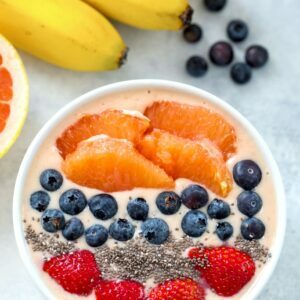 7 Responses to "Grapefruit Smoothie Bowl"
Why have I never thought to make a grapefruit smoothie? Genius and so much flavor! This is such a pretty way to start the day! I have never tried grapefruit in a smoothie bowl, but I will now! oh I love this .. one of my favorites here ins Florida is grape fruit we have a tree! This is perfect thanks! You cannot go wrong starting the day with this big bowl of delicious! What a delicious bowl!! These flavors are just up my alley! I adore grapefruit and never had it in a smoothie form! 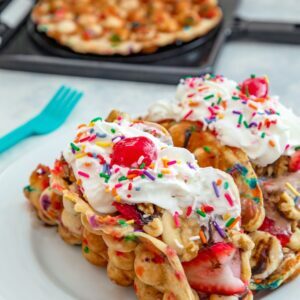 It looks so yummy I am going to try this for tomorrow’s breakfast.